Application to Theoretical Concepts or Frameworks: Similar to the other two pieces, this outfit features artisanal yarns with fine fibers: here including wools, silk, and mohair. The surprising addition of stainless steel to one of the yarns suggests the strength that Saint-Germain usually hid from society, since his superhuman strength could reveal the his true vampiric nature. Inspiration: “Midnight Blue Enigma” is a top and skirt. The crocheted top is composed of two light gray yarns: one of which is 75% mohair/25% silk, the other being 75% wool/25% stainless steel. It features kimono sleeves and a variety of crochet stitches, from half-double crochet to triple crochet. The skirt, in a dark blue merino wool, includes a knitted waistband and hem. The hem is knitted to feature another mountain motif. 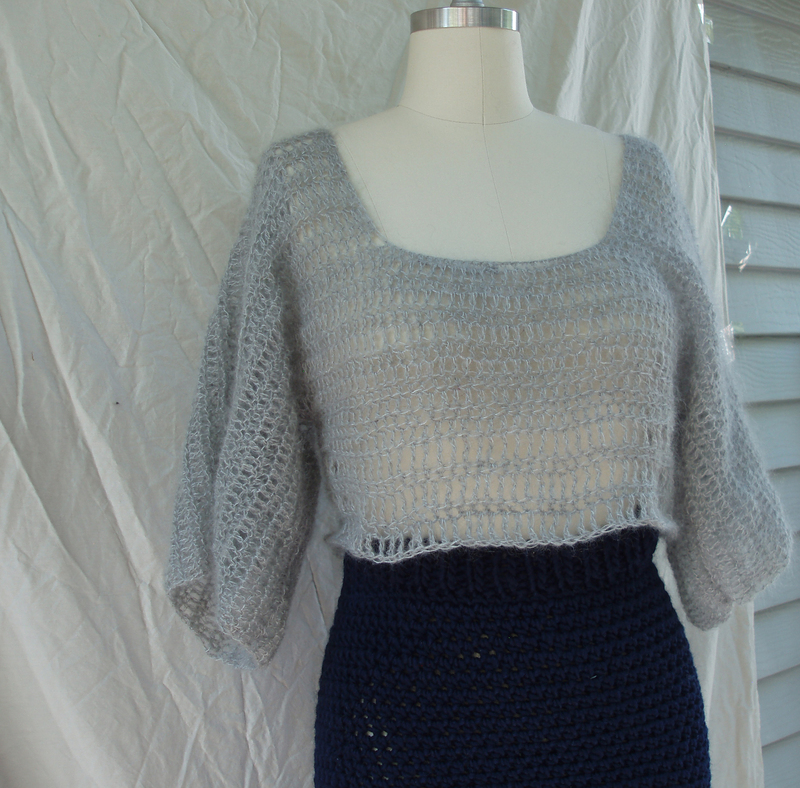 The body of the skirt is crocheted. The dark blue color is important in the Saint-Germain literature primarily because the character himself has unusually dark blue eyes, which are almost blue-black.